Roots Qatar launched off its contracting division in 2002 with a vision of establishing and achieving higher goals in the vibrant and ever growing construction industry in Qatar.The Company has Professionals of Vast experience in various engineering fields in the Middle East. 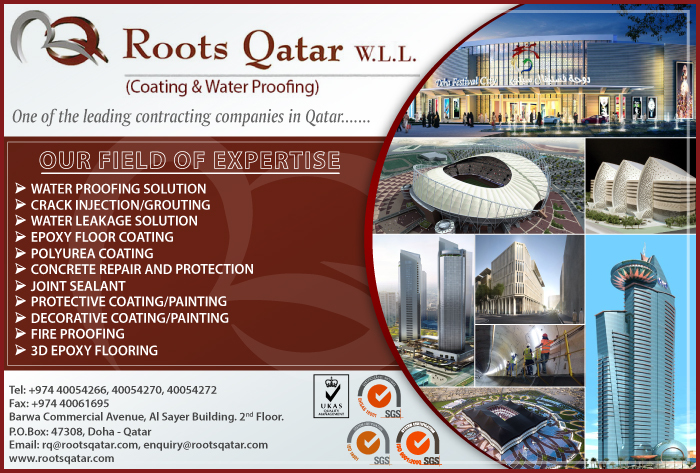 Roots Qatar has its operations in following fields. Our experience will ensure every step of the process is completed using the most time-efficient and cost-effective means. We employ a team of experienced and qualified machinery, painters, water proofing technicians, fire proofing technicians, masons and dedicated laborers.Our painting division is focusing on all types of decorative painting and protective coating works, floor coating, water proofing and fire proofing works with a team of highly skilled painters, technicians under the supervision of experienced supervisors and technical staff. Roots Qatar W.L.L. is committed to effective implementation of quality in every needs of the customer by complying with the project specifications, drawings, contract document, relevant standards company documented Method of statements and Inspection Test Plans. Documents/Procedures shall be developed by the company in line with the customer specifications/documents to ensure effective implementation, control of process, and prevention of nonconformities at all stages of work and to demonstrate adequate confidence in customers that the end product meet his requirements. To be a leader in the Industrial Contracting business. To be recognized by client’s competition, suppliers, and principles as a highly ethical and motivated organization; fiercely competitive, technically competent and innovative, always delivering quality work on time, and always responsive. To specialize managing and completing the projects from start to finish.